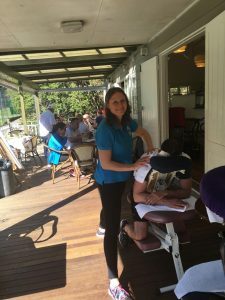 Workplace and Corporate Massage programs like those provided by Absolutely Corporate are growing in popularity as businesses realise the broad spectrum of benefits available, including well documented reductions in work related injury absences and compensation claims. In fact high profile companies like Google and Boeing include regular massage services in the services they provide to their staff, recognising the important role corporate massage and other wellbeing programs can have. 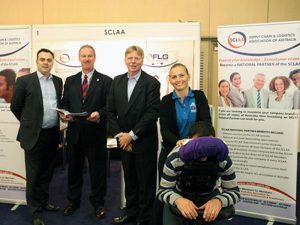 Event and Conference Massage are also areas seeing massive growth as businesses seek ways of providing as much value as possible to their activities, with conference massage offering a flexible program that can be run during or around a conference, helping to keep everyone invigorated, relaxed and focused. Conference massage is a great way of providing a rewarding experience at a conference, while also promoting concentration and helping ease the discomfort that can be caused by sitting for long periods. Not to mention creating an unforgettable, positive memory for all those involved. 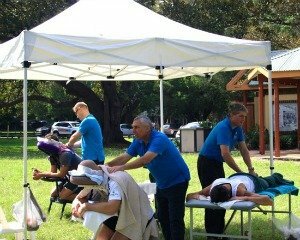 Event Massage is also a popular option, especially for charity sport events where staff are supporting a great cause and often taking part in strenuous physical activity. An event massage stand is a great option to not only support your staff but also help decrease the chance of injuries, while generating some great goodwill. There’ll be plenty of happy faces after a massage and it’s sure to help your business stand out from the crowd. Absolutely Corporate regularly run event and conference massages, such as at the 2016 City2Surf, for Westfield at the Cooper Park Tennis Centre and an annual 20/Twenty Challenge for the Cerebral Palsy Alliance. If you’re interested in Workplace, Event or Conference massage then contact Absolutely Corporate now. We can organise programs for any needs or budget, with plenty of flexibility and the easy convenience of being able to setup in limited space.